MANILA, Philippines - It's Showtime's reali-serye darling Angelica Jane Yap, 21, popularly known as ‘Pastillas Girl’ finally chose her Mr. Pastillas on Saturday, October 17 after more than a month of looking for a man to help her move on from a failed relationship. Pastillas Girl picked Richard "Chard" Parajinog over other suitors, Christopher "Topher" Labao and Michael Enriquez in front of the crowd at at Hoops Dome in Lapu-Lapu City during the Kapamilya noontime show's "Biyaheng Cebu." "Gusto kong magpasalamat dahil hindi lang ako ang napangiti mo, pati ang madlang people ay napangiti mo dahil sa ganda ng boses mo," Pastillas Girl said. "Alam kong mahiyain kang tao pero hindi iyon naging hadlang para mapakita mo kung sino ka. Maraming salamat sa iyo," she told to Parajinog. Parajinog, 23 became an instant favorite of 'madlang people' after he showcased his voice in serenading Yap. 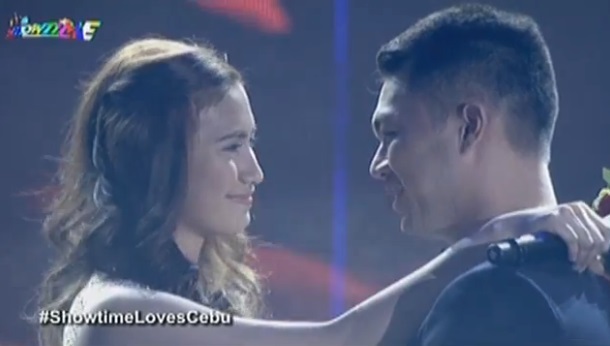 WATCH: Pastillas Girl finally picks her Mr. Pastillas. Video courtesy of ABS-CBN. Yap became part of It's Showtime after her appearance on 'AdVice Ganda' segment. Another segment called 'Nasaan Ka Mr. Pastillas,' a dating game was born for the search of 'true love' for the breakout star of the internet. The segment became It's Showtime's answer to Eat Bulaga's popular loveteam AlDub composed of Alden Richards and Maine 'Yaya Dub' Mendoza. The Movie and Television Review and Classification Board (MTRCB) early in October summoned the management of the show on the alleged 'pimping' of Yap as raised by women's group Gabriela. On October 8, It's Showtime released statement saying that the complaint is "not only unfair and irresponsible, but also hurtful and offensive to women like Angelica who has done nothing wrong but to share her story with the hope of getting another shot at love." The MTRCB has resolved issue on October 15 saying that the show must "introduce scenes depicting her empowerment as a person" and continue to brief Angelica before the segment, as she's now a public figure.